On February 12, 1999, the Bank of Japan announced that it was going full zero. Japan’s central bank would from that day forward push the overnight uncollateralized lending (interbank) rate to the zero lower bound. Further, it pledged to keep it there until Japan’s economy recovered. The economic slump in the nineties had been by 1999 almost a decade in length. As the Japanese economy ground to a halt, unmovable and completely resistant to being restarted by any of the orthodox techniques tried up to that point, there came to be an institutional bid for government paper. It was the perfect illustration of Milton Friedman’s interest rate fallacy – low interest rates signal tight money in the real economy. The bid was pure liquidity risk, having nothing to do with the “fundamentals” of bonds. The bond market for a brief time operated in the same misconception as Japanese central bankers. We are taught from Economics 101 that central banks are central; that when confronted with stubborn economic circumstances they need only use the tools they have available. In nineties Japan, then, what was missing was the will to deploy all of the various methods at the disposal of uninhibited central bankers. The world’s first zero interest rate policy seemed like a change in at least official mindset. The bull market would be history. Except, there is no such thing as a bond bull. It just doesn’t happen, at least not that way. The term has been conjured by bond shorts as a way to make it seem there is no value, therefore no justification, for interest rates staying ridiculously low. We can all agree on at least that idea; interest rates should never, ever be low for a prolonged period. But the bond bears are dead wrong about why they get there and more so why they stay there. Economic and liquidity risks are ultimately what this is all about. Bull or bear, those are fundamental terms inappropriate to the full range of government bond uses.  The bond “bull market” is simply the investors in that market, almost always the very banks themselves, expressing often deep skepticism over these ridiculous monetary schemes. This disbelief, however, is variable. There are times, like late ’98, early ’99 when markets might bet differently; that what might seem like a zero percent chance of success in late ’98 could be turned into a slightly positive chance by the actual implementation of ZIRP in early ’99. 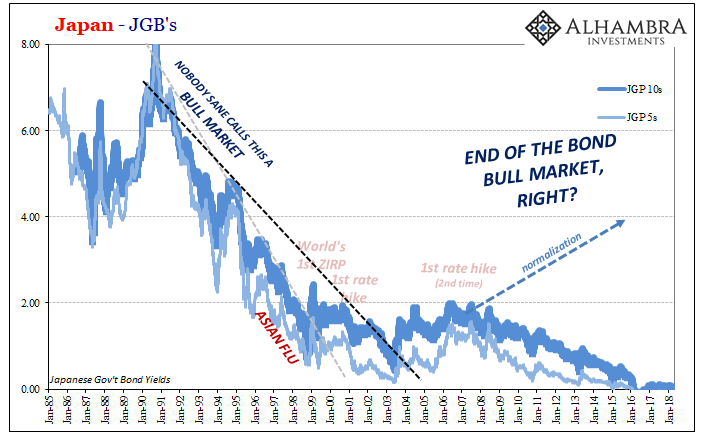 Even as late as the middle of 2000, the “bond bull market” still seemed precarious. In August of that year, the Bank of Japan ended ZIRP based on its forecast of a recovering Japanese economy. Embarrassingly, just months afterward the central bank would be cutting back to ZIRP all over again; the first of many forecast errors on the part of monetary officials who always model their efforts favorably. By the middle of 2003, though the nineties “bull” trendline had stayed steadfastly broken it didn’t matter in the slightest. Interest rates were lower by then than they had been at the lowest point during the prior decade. Like the term, these multi-year lines are ultimately arbitrary and not meaningful. What matters is perception and ultimately correct views on where things are heading. It sometimes can take years for that to become fully apparent. The “bull market” was back in effect for a further three years until 2003, and then it was broken again for an additional four years beyond. 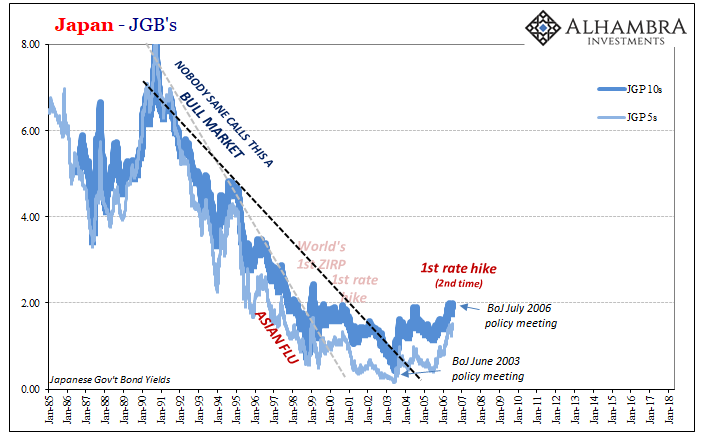 By July 2006, three years after BoJ had turned “hawkish” in June 2003, it would attempt a second “rate hike” regime. 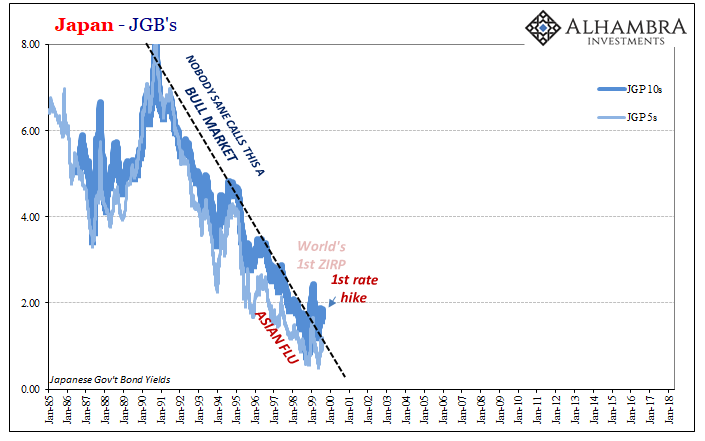 JGB’s had already smashed another even longer long-term trendline long before then; the 10-year yield in July 2006 was the highest since that spike into ZIRP in February 1999. Much was made of the highest yields in seven years. Showmanship, not honest analysis. 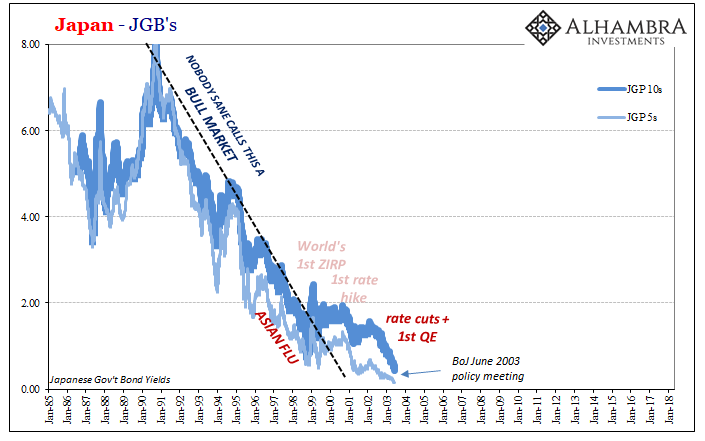 BoJ central bankers would actually get to a second rate hike in February 2007. They expected as did most Economists it was just the beginning of policy, therefore interest rate, therefore economic normalization. 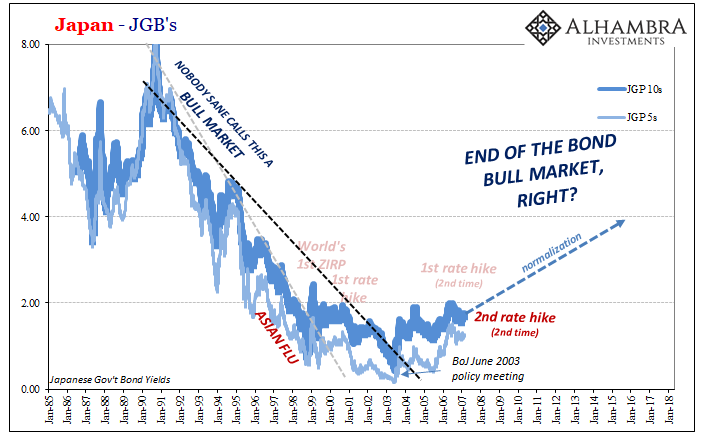 With every “bull” trend broken, the central bank clearly hawkish, the Japanese market was set up for the mother-of-all-BOND ROUTs!!!!!!!!!! It didn’t happen. Instead, as per usual, yet another forecast error. Central bankers were raising their policy rate and ending QE based on actually the same faulty premises. Japan’s economy hadn’t really changed. It had gotten a bit better in the middle 2000’s, but it was increasingly clear to anyone outside the Bank of Japan’s offices that this wasn’t the same as actual economic growth and recovery. The Japanese economy had hit a sort of low ceiling that kept the actual upside very minimal, and therefore the same defects that had come to plague the system after 1989 were still present even more than a decade after the initial crash. We know all-too-well how this story ends – or at least progresses up to the current day. Interest rates in Japan would go on to set new lows, negative yields almost all the way down the curve; even the 30-year bond would get almost to zero during the worst of the last “rising dollar” downturn in 2016. There is no such thing as a bond bull market, which means that it can’t really end at least not on those terms. There is only the bond market deciding upon the right degree of skepticism as to whether the underlying economic condition, meaning money tightness, has meaningfully changed. A categorical shift in baseline direction. Even if doesn’t, there can be times when market participants bet as if there is a chance it might. This is the usefulness of reviewing the JGB’s history. These periods of reflation can last years and break some new ground. But, in the end, the highest rate in years may not really mean what you think. Variable degrees of skepticism just isn’t as shocking and spicy as shouting about the end of the bond bull market. What matters is not where interest rates are, it’s whether or not we are really out. Over time, that’s where prices and interest rates will develop. Given what’s going on now, I wouldn’t be at all surprised if over the next multi-year period UST rates not only register new lows less than 2016 but follow Japan’s under zero for a large part of the curve. It may take some time, there will be resistance from the short end with central banks the last to figure out what’s really happening. Because nothing has changed. Eleven years of “accommodations”, ZIRP’s, and global QE’s and we are still staring at another downturn. The (non-linear) contraction remains in place – worldwide.